Hi...I'm Susan. Let me tell you a little bit about myself. I live in Hampton, which is a little north of Clinton, NJ. It's a great location as it places me pretty centrally in NJ and makes it easy for me to travel anywhere in the state (and even beyond). 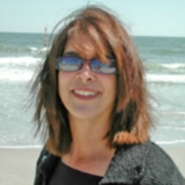 I received a degree in Landscape Architecture from Rutgers University over 16 years ago. But what have I been doing since then and what did I do before? I wasn't always a landscape designer. Prior to finding landscape architecture and design, I did many things. In my early years, I went to Boston University for a degree in Psychology. Well, except for my children, I never really did anything with that! In later years I was in retail, which I came to dislike intensely. And finally, I decided to do something I loved, which involved the landscape. It was one of my best decisions. Since Rutgers, I have designed many types of landscapes, from very small properties to huge estates. Many of my designs have won awards for their creativity, use of color and texture, and attention to spaces, topography, and details. Residential design is mostly what I do, although I have also created designs for commercial properties such as country clubs, government buildings, and townhouse subdivisions. 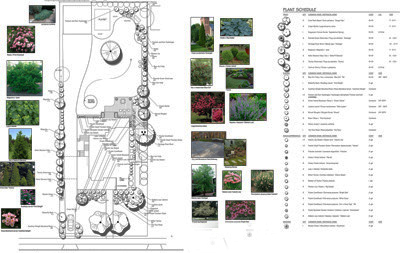 For example, I did an extensive landscape design for the Federal Executive Institute in Charlottesville, Virginia. I have spent time in Europe studying European gardens and garden designers. I often like to incorporate these type of concepts to make my designs more unique. I worked for design/build companies but have had my own landscape design business for 15 years. I lived and worked in Virginia for six years but relocated back to New Jersey in 2010. You may have a project that is very simple or one that is complex. Either way, I would be happy to chat with you about it and discuss how I can help you create a stunning landscape. This is just a sample of the type of design I can provide for you. Yes, those are plant pictures...how great is that to see the plants that are in the design? 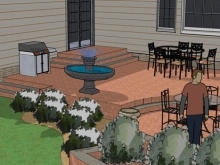 The shape of the patio, placement, hardscape materials, adjacent garden landscaping and even landscape structures become part of the design in the backyard. See our page on patio ideas. 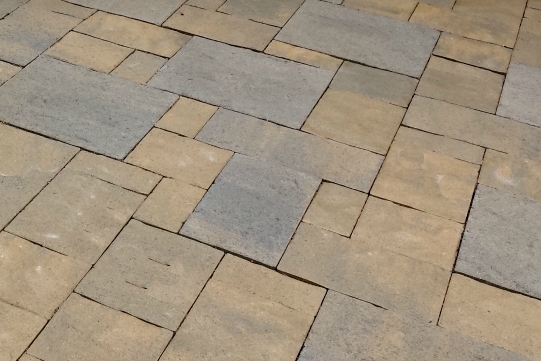 Do you need help choosing paving materials for your patio?I can help you with the advantages, disadvantages and relative costs of various paving choices, and why at times certain hardscape materials are better to use. 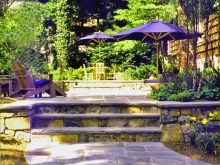 Bluestone patios and walkways, paver patios, colored concrete designs, brick layouts, travertine pavers and others can all be used and we can help you decide which one is best for your landscaping project. Whether you are looking for a simple, budget minded design or a swimming pool design with bells and whistles, let's integrate the pool into the total landscaping design. I can also recommend excellent pool companies and landscape contractors so that the project flows seamlessly. (Yes, it can be done!) Please read about swimming pool designs. We recently designed a pool project that was both challenging and thrilling. This special pool included a disappearing edge, pool beach area, waterfall design, and travertine pavers. 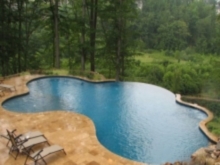 I can discuss with you these types of options for an exciting pool landscape design. I can provide complete, professional landscape designs for your entire property, incorporating the front yard with the backyard so everything flows smoothly. By being creative, working with your landscaping wishes, and making sure everything functions as it should, exciting master plans are created. Let me know if you need help with phasing your project. I work within your planting zone wherever you live in New Jersey. New Jersey has different planting zones. Northern New Jersey is generally 6A, while other parts of New Jersey, such as parts of Somerset County, are 6B. The correct plants must be selected for the appropriate zone. Sun conditions, deer problems, dry soil, wet areas, etc. 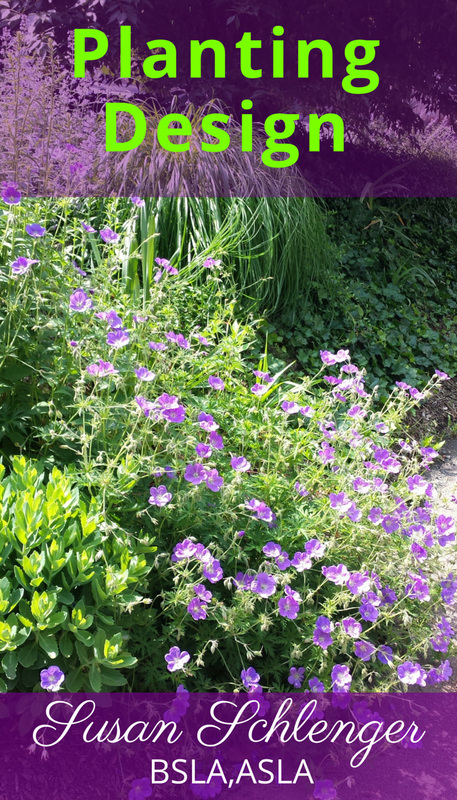 are some of the other considerations when selecting plants for gardens. Planting on a slope can also be addressed so that soil erosion is solved and a nice planting design is created also. Perhaps you will be hiring a landscape contractor. On the other hand, you might be installing some or all of the plants yourself. Either way, as a garden designer, I'll specify all plants to be used in the landscape design. Plants are designated on the drawing, and you will also receive a complete plant list. This will include common and botanical plant names, suggested plant sizes and quantities. This is all part of our professional design service. So if you are looking for a landscape designer, call or email me to discuss your project and get more information.